This week there’s a bit to go over I suppose. I have some newness and sales. I’m getting to where I am planning on certain things to be pretty much weekly. One is the 60L list, I like it. I don’t always make a ton of sales but it’s a nice number for a decent item. Not too low, not too high and I can play round with it. This week I have a few things on sale at the landing for 60L. Should check it out if you’re interested. All are regular items, nothing cheap. Promise. Another group that is new is called Simply the Best, the idea is a group of creators who have been invited as some of the best participate in a weekly sale or do something for the group. This week I have my showers on half off. This really is a great deal. 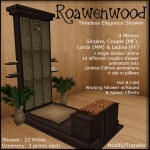 325L for a shower that has BOTH singles animations and LIMITED EDITION animations for couples that aren’t for sale any longer on the grid. The showers are on sale for the week only. A rustic version, and a more ornate fancier version so really there is something for either. The showers also have realistic splash effects and sound. 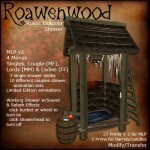 Someone did a real nice blog post too about the showers showing off some of the animations with pictures! Looks really great I think and I really do appreciate them taking the time to do it. Can see it over here: Double Exposure: Shower me with Kisses.